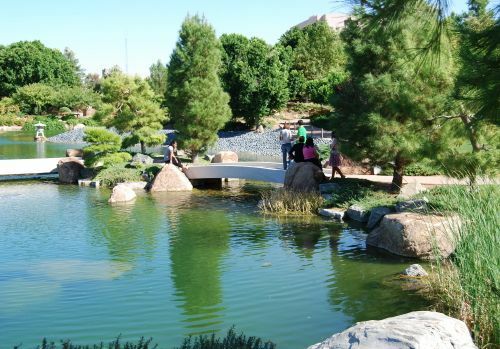 The Japanese Friendship Garden in Phoenix was created to express the positive bond between the people of the United States and the people of Japan. Phoenix, Arizona has had a sister city relationship with Himeji, Japan since 1976. In 1987 the Mayor of Himeji proposed the garden and representatives from Himeji have been instrumental in the garden's design and development ever since. The garden is really a combination of several types of Japanese gardens. Whereas gardens in the U.S. tend often focus on flowers, that is not the case with Japanese gardens. While there are some flowers, the garden is designed in a meticulous way to reflect Japanese traditions and culture. Even the rocks are carefully arranged with a purpose of creating an atmosphere of serenity and artistry. Ro Ho En is a combination of three Japanese words. Ro means Heron, a bird symbol of Himeji City. Ho is the Japanese word for the Phoenix bird. En means garden. Ro Ho En, therefore, is a name symbolizing the friendship between the two cities represented in this garden. In this picture a tour group stops to learn about the shachi, a mythical fish. Private tours and school programs are available on a reservation basis. A pamphlet with directions and information about the garden is provided at the entrance, making a self-guided tour an easy way to become familiar with the garden. Japanese Friendship Garden factoid: The rock used to the line the stream beds, along the walking paths, on the lake shore and used in the waterfall were all hand picked from quarries near Jerome, Superior, Congress and Florence. The Koi pond at the Japanese Friendship Garden is about 5/8 acre. The materials you'll receive at the entrance will explain why Koi are important in Japanese culture. At the entrance, you can purchase fish food to feed the Koi. Please don't throw anything else besides that food in the water. That includes bread, coins, and trash. While we are on the topic of etiquette, keep in mind that this is not a park; it is a Japanese garden designed for meditation and reflection in a tranquil and harmonious environment. Pets are not allowed. Anything that rings or beeps (phones and beepers) should be turned off. No music or picnicking is permitted. Although children are welcome to visit, no bikes, skates or other wheeled recreational devices are allowed. The Japanese Tea House is a replica of a traditional tea house in Japan except for substitutions of certain materials used in consideration of our desert environment. It is surrounded by a traditional tea garden. Only guests who have made reservations for a guided tour or for the tea ceremony may visit the Tea House. The tea ceremony is a spiritual exercise in living and focusing on the moment, leaving the outside world behind. Actually, at a traditional ceremony, guests would enter through a small door in the tea house to symbolize this. You won't be asked to do that here, but you can see the small tea house entry doors. The Japanese Friendship Garden tea house features an abbreviated version of the traditional tea ceremony, presented by tea masters trained in the formal art of the Japanese Tea Ceremony. The tea ceremony is not just about drinking tea and eating snacks. You'll also learn a little about the flower arrangement and art, which is an important part of the ceremony. The experience is meant to be a spiritual refreshment. The ceremony is called Cha-no-yu, which means "hot water tea." A sweet, shown in the photo above, offsets the taste of the bitter tea that is used for the ceremony. The preparation of the tea is not casual or haphazard. Hand movements, instruments used, body motions and the process of making and serving the tea are conducted subject to formal procedures. At the Japanese Friendship Garden tea ceremony, you'll witness the graceful precision intended to facilitate your experience of the tranquility of the tea room. A tea host or hostess spends many years mastering procedures for a tea ceremony, as well as art, poetry, calligraphy and flower arranging. You will have a narrator who will explain the ceremony to you, and there will be an opportunity to ask questions. If you are unfamiliar with the tea ceremony, it can be a bit intimidating! Don't worry--your hosts at the Phoenix Japanese Friendship Garden tea house understand that you are here to learn, appreciate and enjoy. Visitors to the tea house at the Japanese Friendship Garden can expect to spend 30-45 minutes there. You will be asked to remove your shoes. You don't have to sit on the floor; there are tables and chairs. You are asked not to wear bracelets or watches that could scratch the tables or tea bowls. The Japanese Friendship Garden is open October through May. The garden is hours for regular visitors are Tuesdays through Sundays from 10 a.m. to 4 p.m. The garden is closed on Mondays. Group tours are available by reservation only. Ro Ho En is one of several downtown attractions that opens to the public for free on the first Friday of every month between October and May from 4 p.m. to 6 p.m. (dusk) in conjunction with the Phoenix First Friday event. Public Tea Ceremonies are held on the third Saturday of each each month, October through June. Reservations are required, and space is limited. The Japanese Friendship Garden is a popular place for private Tea Ceremonies and wedding ceremonies. Contact them directly for more information about these programs. The Japanese Friendship Garden is located near downtown Phoenix. You wouldn't drive past it on any major street -- it is a hidden treasure! Once you are in the garden, it is difficult to believe that you are in the middle of one of the largest cities in the U.S. The Japanese Friendship Garden is located on 3rd Avenue, north of Roosevelt Street in Phoenix. It is just southwest of Margaret T. Hance Park. From West Phoenix: Take I-10 East towards Tucson. Exit at 7th Avenue. Turn right (south) onto 7th Avenue. At Portland, turn left (east) to 3rd Avenue. Turn left (north). The parking right entrance will be on the right (east) side. Note: 3rd Avenue is a one way street going north. From East Valley: Take I-10 and stay on it. Drive through the Deck Park tunnel. In the tunnel, which begins after the 7th Street exit, move to the right lane and take the first exit, 7th Avenue. It will be the first exit after you leave the tunnel. Turn right (south) on to 7th Avenue. At Portland, turn left (east) to 3rd Avenue. Turn left (north). The parking right entrance will be on the right (east) side. Note: 3rd Avenue is a one way street going north. From Northwest Phoenix/Glendale: Take I-17 South or the Loop 101 South to I-10 East towards Tucson. Exit at 7th Avenue. Turn right (south) on to 7th Avenue. At Portland, turn left (east) to 3rd Avenue. Turn left (north). The parking right entrance will be on the right (east) side. Note: 3rd Avenue is a one way street going north. By Valley Metro Rail: Use the Central/Roosevelt Street station. Here is a map of the METRO light rail stations. For more information, visit the Japanese Friendship Garden online.